Need a quick and easy treat? 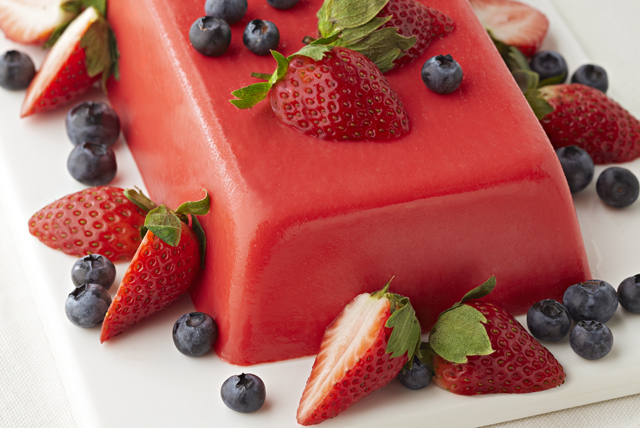 This creamy JELL-O dessert is topped with berries and ready to pop in the fridge in just 15 minutes. Bring 1 can evaporated milk and water to boil in saucepan. Add to dry gelatin mixes in medium bowl; stir 3 min. until completely dissolved. Stir in remaining evaporated milk. Pour into 9x5-inch loaf pan sprayed with cooking spray. Refrigerate 2 hours or until firm. Unmold onto plate. Top with fruit just before serving. Top each serving with a dollop of thawed COOL WHIP Whipped Topping.